Many areas of law intersect, but few attorneys have the ability to address issues across legal disciplines. Providing solutions to individuals and families throughout the Pell City and St. Clair County, Alabama, area has been my focus for more than 16 years, and I do so with a high degree of skill and dedication in a wide range of legal issues. 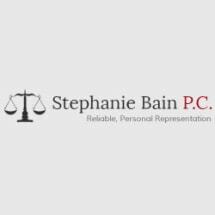 At the law firm of Stephanie Bain, P.C., I represent clients who need guidance in matters of family law, estate planning, personal injury and criminal law. I was born and raised in Pell City and St. Clair County, Alabama, and have always held the well-being of the community and its residents as a priority in my life as well as in my legal practice. I firmly believe that lives can be strengthened by solid legal advice, and I strive to deliver representation with honesty, integrity and dedication to those I work with. Whether you are in need of guidance through a legal process such as divorce or adoption, or need a more aggressive advocate on your side in criminal defense, I can help. No case is passed onto a less-experienced attorney. I work directly with my clients on a regular basis, customizing representation to their unique circumstances. To speak with an experienced lawyer and have your questions answered, contact my office online or by telephone at 205-235-5030. The law office of Stephanie Bain, P.C., is conveniently located on Cogswell Avenue, right off of I-20.